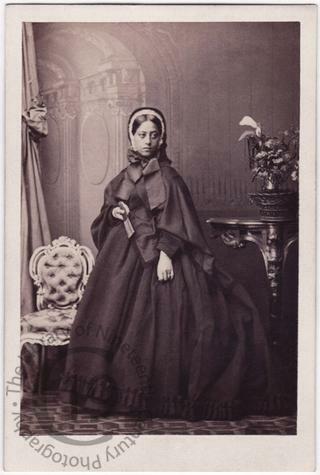 A carte-de-visite portrait of Queen Emma of Hawaii (1836-1885), widow of the Christian monarch King Kamehameha IV. Born in Honolulu on 2 January 1836, her father was high chief George Naea and her mother Fanny Kekelaokalani Young, daughter of John Young, King Kamehameha the Great’s British-born advisor. She was adopted and raised by her childless maternal aunt, chiefess Grace Kama'iku'i Young Rooke, and her husband, Dr. T.C.B. Rooke. Dr. Rooke was a young English surgeon who had arrived in Hawaii in 1830 and was serving as the court physician. While Dr. Rooke raised Emma to be very British, her aunt Grace raised her to be Hawaiian. Emma grew up speaking both Hawaiian and English, the latter with a perfect English accent. By the time she was 20 years old, she was a beautiful and accomplished young woman. She was 5' 2", slender, well-proportioned, with large, beautiful black eyes. Her musical talents as a fine vocalist, talented pianist and good dancer were well known. She was also a skilled equestrian. In 1856, she married Alexander Liholiho, who a year earlier had assumed the throne as Kamehameha IV. The twenty-two-year-old king was tall, handsome, intelligent and well-read. He was also fluent in both Hawaiian and English. Two years later, in 1858, Emma gave birth to a son, Prince Albert Kamehameha. The child died four years later and the following year, Queen Emma became a widow when the young king died at the age of only 29. When King Lunalilo died in 1874, Emma became a candidate for the throne. Lunalilo had wanted her to succeed him, but he failed to make the legal pronouncement before he died. Had he done so, she would have reigned as sovereign queen. Instead, an election for a new sovereign was held and although she campaigned actively, she lost the throne to David Kalakaua. In 1883, Emma suffered the first of several small strokes and died two years later on 25 April 1885 at the age of 49. She was given a royal funeral and was buried in Mauna 'Ala beside her husband and son. Photographed by Camille Silvy of London on 16 September 1865.